On Dec 11, 2014, researchers from HEC Montreal, the Business School at University Montreal, released an assessment of the State of Energy in Quebec. 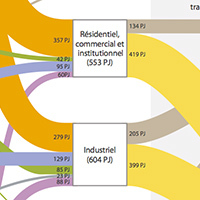 The French-only report - État de l’énergie in Quebec – 2015 - received much attention in the province, but less so in other parts of Canada, even though the insights are important and relevant to all Canadians. As contributors of both data and graphics to this study, CESAR researchers have a special interest in the work, and thought that a blog on the report would be a good way to kick off 2015. It has been more than 6 months since the last Blog post from CESAR. We have not been on an extended vacation, but have been focusing on a number of exciting new research projects to explore past, present and possible future energy systems of Canada. Over the next few months we will be telling you about some of the work we have been doing lately. We hope that you will find it as interesting and stimulating as we do. The report was written by Johanne Whitmore, Energy Research Specialist, and Pierre-Olivier Pineau, Chair in Energy Sector Management at HEC Montreal. In explaining the reasons for launching the study, Dr. Pineau noted that, “… although Canada is the world’s fifth-largest energy producer, the provincial and federal governments do not provide global and structured access to energy data. This can … limit our understanding of the sector, affect perceptions and even hinder decision making on the issues at hand.” Those issues include how best to transform energy systems, stimulate the economy and address environmental concerns. To get access to the necessary data for their examination of the energy situation in Quebec, Ms. Whitmore and Dr. Pineau approached CESAR and whatIf? Technologies Inc to obtain Quebec data for 2012 from the CanESS Model, validate it against government data sources and then generate new visualizations in the form of Sankey diagrams. Only 50% of the energy that moves through Quebec’s energy systems is ‘useful’, delivering the requested energy services. The rest is lost in converting one form of energy into another, or in converting energy currencies to services. In 2013, Quebec imported 93 PJ of electricity, mainly from Newfoundland and Labrador, with whom the province shares the strongest interconnection (5.2 GW). However, for electricity export, Quebec is more connected to the US than to other provinces in Canada. In 2013, Quebec exported 87 PJ, primarily to Vermont and New York. Quebec would like to strengthen its electricity trade with neighbouring provinces, as reflected in recent agreement they signed with Ontario. Quebec committed to a 20%-reduction of its GHG emissions from 1990 levels by 2020. Stationary sources (industry and buildings) have been reduced by 30%, transportation emissions have increased by 26% for transportation. Consequently, the overall GHG emission reduction has been only 3%. The transportation sector accounted for 78% of total consumption of petroleum products and was responsible for ca. 43% of all GHG emissions in Quebec (see Figure 2). In 2013, Quebec had 6.19 million vehicles on the road, 4.5 million of them passenger vehicles. Only 2,327 electric cars were used in Quebec, less than 0.04% of all vehicles. Fuel sales at the pump for all service stations rose from $9.8 B in 2008 to $11.9 B in 2012 – a 22% increase, while the price of regular gas was up by only 13%. In January 2013, Quebec launched its cap and trade system for greenhouse gas emissions allowances. This market is linked to the Californian one, in the framework of the Western Climate Initiative (WCI). The cap and trade system encompasses large industrial and electricity emitters and now includes fossil fuels sources, such as natural gas, gasoline and any refined petroleum products. The system will feed a Green Fund to finance the 2013-2020 action plan on climates change. Quebec imports 100% of the crude oil it refines. In 2013, crude oil was mainly coming from Africa (47%), North Sea (12%), and Mexico (7%), while imports from the rest of Canada accounted for only 5% of the total. Quebec’s refinery capacity is about 402,000 barrels per day, which exceeds by 39% the province’s needs for refined petroleum products. Quebec’s two refineries account for 20% of Canada’s capacity and the province exports 113,000 barrels of refined products per day. The reversal of Enbridge line 9B should be a game changer in 2015. It will allow Quebec to import oil from Canada’s Western provinces or the US states. Between 1990 and 2011, the average energy intensity (MJ/household) of Quebec households decreased by 27% per square meter, but a simultaneous 14% increase in the size of each dwelling undermined the gains. Energy intensity in the industrial sector (MJ/$ of GDP) decreased by 30% between 1990 and 2011. Based on these and other insights, the report makes a number of recommendations, including some related to the need to transform transportation, improve efficiency standards for buildings and appliances, enhance interprovincial partnerships on electricity trade, maintain the price on carbon, and the develop a pan-Canadian energy strategy. The HEC Montreal team is planning to make their energy systems report an annual initiative. The CESAR team applauds this work and is eager to work with them and interested parties from other provinces wanting to better understand their energy systems and how best to move them towards sustainability. Thank you from the Chair in Energy Sector Mgt - HEC Montreal! Thank you David, Benjamin and Baastien for your collaboration on this unique project, as well as this very useful blog for english speaking audience! You need to be a registered user to receive CESAR's latest blogs or post comments.